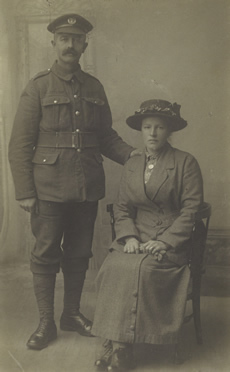 An archive of historical images of East Clandon. Old Harry - former resident of Old Harry's Cottage, Back Lane and landlord of The Queens Head. 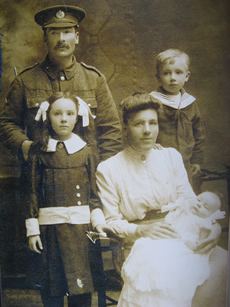 Matthew and Agnes Huggins with children James, Winifred and baby Hilda. (1915). Taken while Matthew was on leave from service in France. 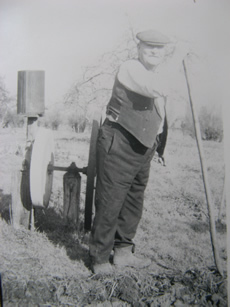 Mattew Huggins 40 years later in the mid-1950's.The Huggins family operated a workshop in Back Lane and had this huge hand wound sandstone for sharpening tools. This photo was taken after his stables and workshop were demolished and before the bungalow was built. 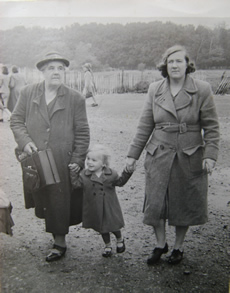 Agnes Huggins, Diana Haines and Hilda Haines (1948) on the "Pie Outing". There were two coach outings from East Clandon each summer – the "tontine outing" and the "pie outing". These were all-day outings to either Bognor, Littlehampton or West Wittering. It was for people who had been contributing to a co-operative insurance scheme during the year. For some people in the village, these coach outings were the only time they went to the seaside. 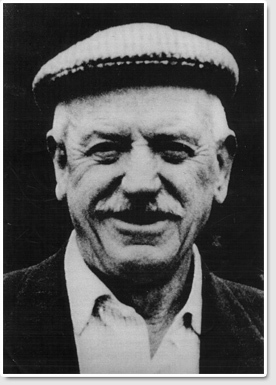 For more, see page 6 of Tony Hallett's memoirs.